The Chant of Jimmie Blacksmith was the second feature directed (and written and produced) by Fred Schepisi, who, along with Peter Weir, Phillip Noyce, Bruce Beresford, Tim Burstall, George Miller and Gillian Armstrong, was one of the key directors of the “New Australian Cinema” of the 1970s and early 1980s. Adapted very faithfully from the novel by Thomas Keneally (later author of Schindler’s Ark), the film concerns a young “half-caste” in turn-of-the-century Australia who feels torn between the values and aspirations of white society on the one hand, and his Aboriginal roots on the other, and who thus takes to violence against his perceived white oppressors. Like Schepisi’s debut film, The Devil’s Playground (1976), The Chant of Jimmie Blacksmith is set in Australia’s past, at the time during which the country can be said to have achieved nationhood (roughly from the 1890s to the end of World War I). The period film, or, as it has been termed, the “AFC genre” (because the national funding body, the Australian Film Commission favoured such films as culturally respectable representatives of Australian-ness) was at the very centre of the Australian feature film revival. Peter Weir’s Picnic at Hanging Rock (1975) is popularly credited with beginning the trend and establishing many of the recurrent features of the genre, such as its basis in literature, its pictorial treatment of the rural landscape and its thematic emphasis on institutions and education, and how they are often inimical to personal individuality and positive self-identity (see, in particular, the female experience as charted in Gillian Armstrong’s My Brilliant Career  or Bruce Beresford’s The Getting of Wisdom ). The style of the film, particularly its editing and mise en scène, are perfectly attuned to this central political thematic core. The opening, pre-credit sequence that cuts between the young Jimmie undergoing his tribal initiation in the bush and the Reverend Neville at home bemoaning his unexplained absence, perfectly lays out this style. The disparity and distance between the races, between the whites and the Aborigines, is immediately underlined in the contrast between the cluttered, sterile and materialistic indoors of the Neville household on the one hand (littered with crockery similar to that later smashed as Jimmie murders the Newbys), and the natural, open expanses of the bush on the other. To reinforce this, there is a later scene at the Neville’s dinner table in which Jimmie, on the eve of going out to make his way in the world, thanks the Reverend and his wife for his “education”. In one extended sequence shot, the camera begins framing the meal on the table before tilting up on the Reverend (dominant in the centre of the screen and at the head of the table) and slowly tracking out to tightly frame the scene from a distance through the doorway, with Jimmie hemmed-in screen left. This underlines Jimmie’s entrapment within his social position by visually stating his constriction within the frame, a frame dominated by the Reverend and all he represents. As in Keneally’s source novel the film’s narration, though ostensibly third person and unrestricted, aligns itself closely with the titular protagonist’s mindset and his experience of the two communities between which he is torn (something that makes a nonsense of Annette Van den Bosch’s criticism that it fails “to make concrete an analysis of the social formation in the period, and to place these in relation to historical forces”) (2). Most obviously, this can be seen in his (arguably subjective) view of many in his Aboriginal community as drunken layabouts and his subsequent feelings of hatred towards the perceived white bigots who have repeatedly demeaned him. Again the mise en scène underlines this: the aforementioned scene at the Neville’s dinner table contrasts with many exterior scenes where extreme long shots repeatedly frame Jimmie as dwarfed by the landscape around him, graphically foregrounding the fact that, unlike true Aborigines, Jimmie cannot live with the land and achieve liberation and freedom within it. Like a white man, his specific wish is to own land, and this white desire to conquer and to dominate the landscape (one of the key myths, issues and problems of Australian nationhood) crucially separates him from his spiritual roots as represented in the opening scene’s tribal initiation. Other features of the film also reinforce this theme of segregation and of Jimmie as homeless in the wilderness: Jimmie’s job constructing fences highlights a sense of separation and of ownership of land; and the sporadic cutaways to close-ups of insects and snakes (reminiscent of the seminal Walkabout [Nicolas Roeg, 1970]) connote a sense of the hostility of the land through which Jimmie passes, a land as alien to him as to the middle class white schoolchildren of Roeg’s film. Conversely, whilst the film’s narration can be seen to work in this faux-subjective manner, it simultaneously maintains a largely objective camera and editing style for much of its duration, with almost no optical point of view shots. This functions in a similar way to the representation of the prostitute Dallas in John Ford’s seminal western Stagecoach (3): that is, by denying Jimmie any overt look, any gaze, Schepisi thereby figuratively connotes his fundamental lack of social agency and standing, his powerlessness. The one main point of view shot allowed Jimmie is when he is captured and carried from the convent whilst being harangued by whites. In other words, he is privileged with a look only at the moment that the looks at him by those higher in society than he (visually underlined by having Jimmie look up at them) are at their most pronounced. Finally, the domestic and international reception of The Chant of Jimmie Blacksmith is worth briefly elucidating as it played its part in opening up Australian cinema internationally. 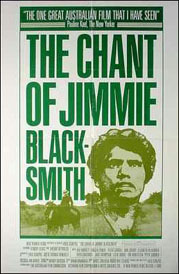 When it was first released in Australia in 1978, The Chant of Jimmie Blacksmith received an equivocal critical reception and was a relative failure at the domestic box-office. The reception of the film abroad, however, was much more uniformly positive. Pauline Kael in the United States was effusive in her praise for the film, whilst Schepisi was invited to Cannes in a continuation of that Festival’s love affair with new Australian cinema that had been initiated by Ken Hannam’s archetypal Sunday too Far Away (1975) – it had also included The Devil’s Playground in its director’s fortnight in 1976. In 1978 there were 20 Australian films at Cannes including The Chant of Jimmie Blacksmith, which importantly played in official competition, a first and a major breakthrough for Australian National Cinema. Following this, several new Australian films were significant hits at the Festival in the next two years, specifically Armstrong’s My Brilliant Career in 1979 and Bruce Beresford’s Breaker Morant in 1980 (for which Jack Thompson won an acting award). These two films both gained American distribution based in part on the strength of their European reception, and their respective European festival success was built on the foundations of the breakthrough of The Chant of Jimmie Blacksmith. It truly was an Important film, even if, as Tom O’Regan hints in Australian National Cinema, its reception in Australia prompted Schepisi to move to America to continue his career: his next film was to be the western Barbarosa (1982) (4). Jonathan Rayner, Contemporary Australian Cinema: An Introduction, Manchester University Press, Manchester, 2000, p. 80. Annette Van den Bosch, “Australian History and its Reconstruction in Australian Film”, The First Australian Film and History Conference Papers 1982, ed. Anne Hutton, AFTRS, North Ryde, NSW. See Nick Browne, “The Spectator-in-the-Text: The Rhetoric of Stagecoach”, Film Quarterly 29, Winter 1975–6, pp. 26–38. Tom O’Regan, Australian National Cinema, Routledge, London, 1996, p. 59.